Renovo Hood Reviver is the ultimate product to make old, faded, fabric convertible tops, RV and boat covers look like new. A permanent, water based dye that may be applied with either a nylon paint brush, sponge, disposable foam brush or air brush and dries in 2-3 hours. Badly faded tops may require a second coat. 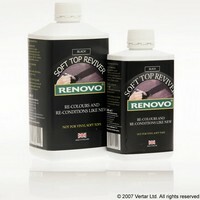 Clean the surface thoroughly with Renovo Fabric Soft Top Cleaner and then allow it to dry completely. Use Masking Tape to mask off the rear window, the glass and paint. Start the application at the center section of the front of the top. Work from side to side, progressing towards the back, maintaining a "wet edge" as you work towards the rear. (The technique is similar to painting with water based paint). Immediately remove any drips on paint, glass or trim with a wet cloth. If the top is badly faded, apply a second coat after 24 hours drying time. Allow the final coat of Reviver to dry for 24 hours and then follow with a coat or two of Renovo Fabric Ultra Proofer to protect and prolong the life of your new looking top. DO NOT use on vinyl or vinyl impregnated fabric tops. When in doubt, consult the manufacturer. A 500 ml bottle will normally cover the average top with one coat. Excellent product when using all three stages.These were delivered within a few days.I have a ten year old Mercedes Clk that is immaculate bar the roof that was slightly faded,having used Renovo Reviver applying two coats and following the simple instructions the roof has turned out like new and now is in standing with the rest of the car.Considering the very reasonable cost and the easy application this is highly recommendable.Completly satisfied customer. Thank you very much. dark blue roof, very faded and algae in the seams!...was really letting this 19 year old car down I had only owned for the last 15 months. Checked the reviews and this was highly recommended. I was low on funds so only bought the dye but followed other Saab sites recommendations for a quick makeover and I am truly amazed...yes, the Mrs did say it looked a little dark for a couple of days but now actually looks a stunning dark blue again. I think we had just got used to its severely faded state!...definitely the one to try first....excellent result! My MG Midget has a 25 year old cloth hood and it was a very light grey and almost totally porous after being garaged for a decade. Renovo in black restored this to a nice dark black with one coat. I'll be using the waterproofer next but the hood literally looks like a new one. Great product. Reviver in black and Ultraproofer. Id been frightened to take the plunge and use the black reviver in case it ruined or I made a mess of the fabric hood on my year 2000 megane. Having followed the instructions it couldnt be further from the truth! Very easy to apply with a new paintbrush and re-colours after the first coat, but dont try and skimp, a second coat is worth it and I got 2 decent coats (and some left over) from a 500ml bottle. After giving the reviver time to fully dry I applied 2 coats of ultraproofer from a 1000ml bottle and Im extremely pleased with the result. The products will naturally run off the roof at certain places just like the rain does so have a roll of kitchen paper at hand to catch it/pack those areas. Its been several weeks since I did the roof and, even after heavy rains Ive had no black streaks down the paintwork. Dont try and rush the whole process, I set aside 3 days and kept my car in the garage until fully dry and finished, the outcome is worth the hassle. Just used on my 1998 306 Cab and even with first coat the effect is fantastic. Very easy to apply and, as other ads say, it does what it says on the tin!! I bought the Renovo Reviver, Waterproofer and window polish an the strength of reviews from this site and I can now add my own stamp of approval! I used the Reviver on the original roof of my 11 year-old BMW 318i and the results are amazing! Just follow the instructions on the pot, slap it on with a paintbush and stand back and admire the results!! My softtop now looks like new and I have enough left in my 500ml bottle to do another coat! Outstanding British product and worth every penny! My hood on my Smart Roadster looks really good with one coat of this. It was a really shabby grey and covered in green mould spots. One coat covered it up a treat and was so easy to apply. My son was impressed that his mother had made such a good job. Going to get the sealant stuff next for it. I am so satisfied with this product... couldnt been better! Bought the full package,waterproofer etc. Excellent results. Will add value if you are selling a car with faded roof. Be careful to work to wet edges to prevent tide marks as highlighted in instructions. Car 6 year old SAAB cabriolet. Original hood (black) was totally waterproof but had faded somewhat with the sun etc. I discovered your product through an internet trawl and decided to give them a try. Two coats of Black reviver with a finish of waterprofing. I allowed a total of 5 days so the treatments would dry correctly.Very easy to apply. Was very, very impressed with the result. I still hve enough material for one coat of each in the distant future. This stuff really does work!! I used it on my BMW Motorsort Convertible and it has enhanced the look superb! The ultra proofer makes my roof waterproof too-Both are excellent products. I would reccomend these products to any one who has a faded roof or discolouration..
Used it on my sports boat cover, needed two coats but iam very pleased with the finish. I was sceptical but the outcome was excellent!! I purchased a Rover MG last year and with standing outside in all weather, the hood deteriorated to such an extent that I was considering buying a new hood. I then discovered Renovo's products and thought I would give it a go. The hood was badly faded and full of stains and green mildew. After using the special shampoo, I followed the instructions and followed up with the Hood Reviver which I painted on with a brush. After several hours when the hood was completely dry, I used the waterproofing which I found easier to apply with a sponge rather than a brush. The result is so outstanding that I am no longer considering buying a new hood! Absolutely brilliant results on a very tired and green with alge hood on my Saab 900 Convertible. Came up like new, highly recommended. "Excellent customer service, order to Germany only took two days! The P21S wax is smashing, fantastic!"